The Children of St Marks Primary School are having a non-uniform day in February to help raise money for the trip's charity, Newbury District Cancer Care. The Rainbow Room is funded by the charity and the children will be wearing rainbow themed clothes (if they want to) - to brighten up the long winter days! 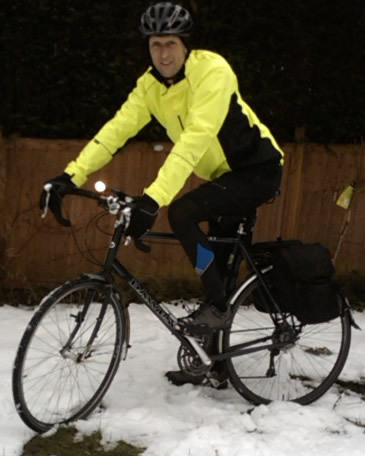 Pictures to follow after the assembly where I am hoping to tell them that long distance cycling has a lot to do with school: Calculating distances, Geography, Problem Solving etc - should be fun. 7th Feb 09 - The school assembly was postponed until 8th May due to the school bring closed because of snow. The icy roads have also put a halt to training, after coming off a month ago I'm a little apprehensive of black ice so have resorted to indoor biking and pulling sledges up steep hills! 2nd Mar 09 - GYM sessions start!! For the next 2 months 8am to 9am is the new routine. 14th Mar 09 - Lost somewhere near Devizes! 27th Mar 09 - GPS tracker added to site. Now the phone in my pocket will transmit my location every few minutes and you can select the type of map to view if you want to literally "followsimon"! 4th Apr 09 - Brought back to life with Mars Bar! 4th Apr 09 - Speed record smashed! A mile long 14% descent into Hurstbourne Tarrant propelled me to my fastest speed of 42.4mph. 9th Apr 09 - £1000 of donations online at www.justgiving.com/followsimon - a third of the way to the target - thank you! 22nd Apr 09 - Banjo Bikes in Newbury BG FIT assessment. 8th May 09 - A really nice welcome at St Marks School for the assembly. Thank you all so much for the £280 raised. I wont be able to update the news whilst on the go so check the RIDE LOG for daily updates and THE ROUTE for where I am. 11th May 2009 - No more news for now, up at 4am tomorrow and at last we are on our way. Keep an eye on the Ride Log for more updates.